Yeah, OK... I don't quite follow that, but onward and upward. Here’s a recipe just in time for two of the biggest celebrations this year in North America. This weekend Canada celebrates its 146th birthday. The actual date is July 1, but we will be celebrating all weekend. Next week, on July 4, the United States celebrates its founding. That falls on a Thursday this year, so most folks will be taking Friday off as well, making for a 4-day weekend. Hopefully we’ll be seeing a lot of our American cousins this side of the border. So it’s going to be a big week, full of outdoor activities like going to the beach, camping and lots of backyard parties and cookouts with family and friends. Rubs are a good alternative to barbecue sauces, and if they’re a good recipe can impart just as much flavour. This is the mixture before adding the whisky. My big problem with sauces is they often have a lot of sugar in them and tend to burn, especially over open flame like a barbecue. Rubs, with less sugar, not so much. Rubs fall into two main categories: dry and wet. Essentially both are mixtures of spices that are applied to meat before they are barbecued. A rub applied just before cooking flavours the meat. A rub applied hours before flavours as well as tenderizes the meat, depending on what’s in it. Dry rubs contain only dry ingredients. Common ingredients are spices, garlic powder, onion powder, peppers and salt. Wet rubs are the same, but as the name suggests also contains something wet, usually vinegar or oil. The combination is of a paste-like consistency. My rub contains whisky, just ‘cause. 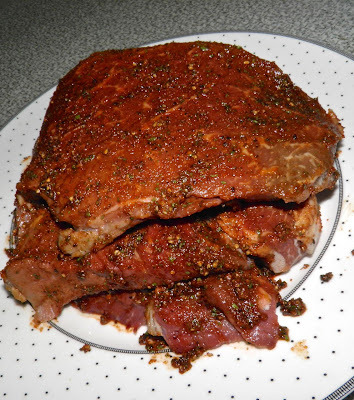 Both types of rubs can be used just before cooking or as a sort of “marinade” overnight. The main difference is that wet rubs tend to stay on the meat better as it's being cooked. Rubs are also kin to mixtures used in making the the finest of charcuterie. The rub imparts flavour over weeks or months instead of minutes or hours. 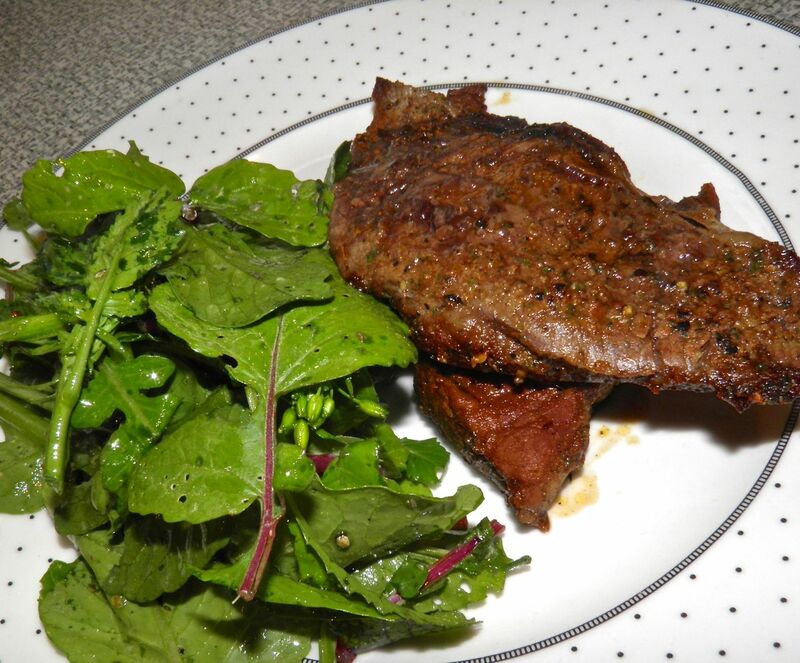 The process to finish the meat is sort of “dehydration” rather than cooking. Here’s a little trivia for you about the origins of barbecue. It’s actually Caribbean than Southern USA. Of course its popularity in the Deep South has now far surpassed Caribbean popularity. The word "barbecue" is from the Spanish barbacoa and/or the French babracot, both of which come from the indigenous peoples of Haiti and Guiana. Both refer to cooking meat by draping it across moist wood over a fire until it dries out. simple oil, vinegar & oregano dressing. “Real” barbecue is still done in much the same way. Barbecue isn’t really slapping a piece of meat on our outdoor cookers. That’s grilling. Barbecue is a slow method of cooking in an enclosed space over low, constant heat. The slow cooking breaks down the connective tissues in the meat and tenderizes it. Anyone from the South who is reading this knows exactly what I mean. Rub is perfect for real barbecue as well as the more common grilling. It’s also great for steaks cooked inside, if you happen to be reading this in the winter. This rub is pretty flavourful, with a bit of a kick. You can adjust that kick with the amount of cayenne pepper you use. The reason I called it “red eye”? Two reasons. First is the obvious colour. The second is because if you use the full amount of cayenne it ill certainly snap open anyone’s red, tired eyes! If you want to try something other than barbecue sauce this weekend try a wet rub. This will work equally well on pork or chicken. Maybe even shrimp or some firmer, stronger flavoured fish "steaks." 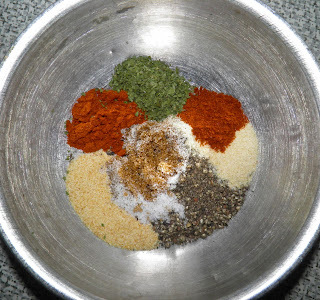 Mix all the rub ingredients together in a bowl. Distribute the mixture evenly over the steaks and, as the name suggests, rub it in. Let the steaks rest on the counter for at least 30 minutes, or in the refrigerator overnight. heat up the grill and you’re on your way!